I am currently a research associate at the Thayer School of Engineering at Dartmouth College. I study how the material properties of ice record information about past climate. I'm originally from Cleveland, Ohio (Go Tribe! ), and did my undergraduate studies in Materials Science and Engineering at the University of Cincinnati. Afterwards, I earned my PhD in Materials Science and Engineering at the Thayer School of Engineering at Dartmouth College. I discovered my love of field work during my first trip to the Greenland Ice Sheet. Since then, I've been lucky enough to go back many times. Another big component of my research involves lab work conducted in freezers across the world. Believe it or not, I enjoy that too! Despite my love of snow and ice, I'm currently based in Gamboa, Panamá. Ice cores have become a critical tool for understanding the past climate of Earth. The layers of ice leave behind evidence of past climatic events. One kind of event that has dramatic effects on the polar landscape is widespread melting of nearly the entire surface of the ice sheet. These melt events can cause massive flooding and erosion, and may even compromise the integrity of the ice sheet itself. Previously, I linked these melt events to large Northern Hemisphere forest fires, which deposit black carbon onto the surface of the ice sheet, lowering its albedo below a critical threshold. I am currently analyzing melt layers in firn and ice cores to determine the spatial and temporal extent of widespread melting events on the Greenland Ice Sheet in the past, as insight into what may happen in the future. To interpret ice cores, we must correct for the inherent difference in age between the ice layers and the air bubbles they trap--a difference caused by continuous gas diffusion through the firn column. The microstructure of the pore space can critically affect the rate of gas diffusion through the firn, and we must be able to model this effect in order to properly interpret paleoclimate records. I use an array of techniques, including X-ray micro-computed tomography (micro-CT) and measurements of permeability to model the impact of microstructure on the ice age-gas age difference. 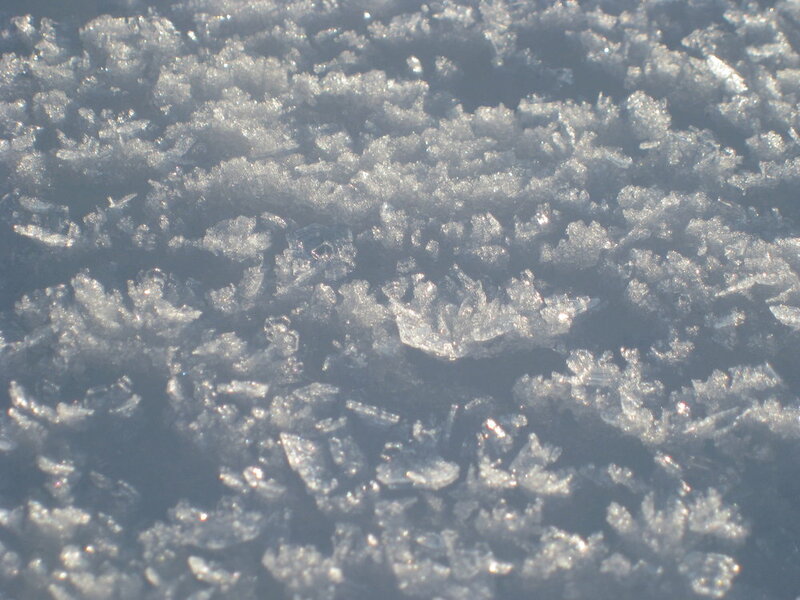 The grain size and crystal orientation of ice have a big effect on how ice deforms and flows. This is especially important to understanding how quickly ice will flow off the continental ice sheets and into the sea. I have setup experiments to deform ice core samples under realistic conditions to determine how the physical properties of ice affect ice deformation. I also study how chemical impurities interact with the physical properties of ice and alter this deformation effect. The results of these studies will be used to improve ice flow models which in turn will allow us to better predict rates of sea level rise. Keegan, K.M., M.R. Albert, J. McConnell, and I. Baker (2019), Climate effects on firn permeability are preserved within a firn column, Journal of Geophysical Research, in press. Keegan, K.M., M.R. Albert, J. McConnell, I. Baker (2014), Climate change and forest fires synergistically drive widespread melt of the Greenland Ice Sheet, Proceedings of the National Academy of Science of the United States of America, 111:7964-7967. Keegan, K.M., M.R. Albert, and I. Baker (2014), The impact of ice layers on gas transport through firn at the North Greenland Eemian Ice Drilling (NEEM) site, Greenland, The Cryosphere, 8:1801-1806. Dahl-Jensen, D., M.R. Albert, A. Aldahan… K.M. Keegan… (many authors, listed alphabetically) (2013), Eemian interglacial reconstructed from a Greenland folded ice core, Nature 493:489-494. S. V. Nghiem, D. K. Hall, T. L. Mote, M. Tedesco, M. R. Albert, K. Keegan, C. A. Shuman, N. E. DiGirolamo, G. Neumann(2012), The extreme melt across the Greenland ice sheet in 2012, Geophysical Research Letters 39, L20502, doi:10.1029/2012GL053611. Measuring firn permeability in a snow pit at NEEM, Greenland. "Dark snow: from the Arctic to the Himalayas, the phenomenon that is accelerating glacier melting," The Guardian 5 July 2014. "Greenland ice may melt even faster," climate news network.net 24 May 2014. "Nearly All of Greenland's Surface Melted Overnight in 2012 - Here's Why," Smithsonian.com 19 May 2014. "Greenland Ice Sheet Melt Could Occur Yearly By 2100," climate central.org 19 May 2014. "Not Just Warming: Forest Fire Ash Also Drove Surface Melting of Greenland Ice Sheet," science20.com 19 May 2014. "Record Greenland Melt Got Boost from Forest Fires," Livescience.com 19 May 2014. "97% of Greenland surface ice turns to slush," New Scientist 4 August 2012. "An inside look at Greenland's melting surface ice," The Washington Post 3 August 2012. "'Unprecedented' Greenland Surface Melt - Every 150 Years?," New York Times, Dot Earth 25 July 2012.